Loaded with patented FTX bullet, the 45 Colt has been maximized for performance in the short-barreled platform of the Taurus Judge. It offers expansion even through heavy clothing, delivering real man-stopping power. The 45 Colt Critical Defense load has been maximized for performance in short-barreled platforms, and is a fantastic choice for the very popular Taurus Judge. 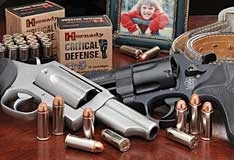 The 45 Colt Critical Defense load offers real “man-stopping” power.